House Democratic leaders on Thursday eagerly discussed their plans to lower prescription drug prices, expand health insurance coverage, and build roads, sewers and rural Internet links. But when it comes to the migrant crisis on the southern border, they had few remedies. Numerous Democratic lawmakers — pressed on the surge of mostly Central American migrants who have streamed to the border seeking asylum, taxing U.S. personnel and policies — mainly shared frustration with President Trump and his administration and blind hope for a comprehensive immigration deal that appears as far away from reality as ever. Lawmakers spoke as Democrats gathered for their annual retreat. The lack of an easily articulated alternative to Trump’s hard-line border policy stands as a persistent challenge for Democrats both in Congress and on the presidential campaign trail as they approach the 2020 election cycle increasingly confident on other fronts, such as health care. 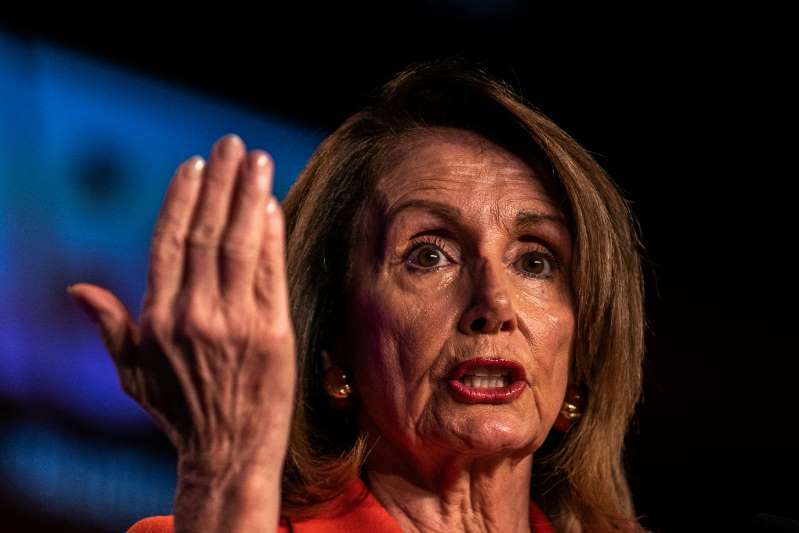 But when asked about potential legislation aimed at stemming the crisis, Pelosi pointed to extra money for immigration-related agencies that Democrats negotiated into a February spending bill, lamenting that Trump “has not utilized what is in that specifically to the border,” before pointing to the need for an “overarching” immigration deal with Trump. “I’m not giving up on the president on this,” she said, despite years of false starts on bipartisan immigration negotiations dating back well before Trump’s election. The absence of a unified Democratic alternative to Trump’s hard-line vision reflects both the limits of legislative power and divisions on how the party should approach immigration policy in the face of Trump’s “open borders” attacks. Inside the closed-door party retreat Thursday, according to multiple attendees, a session on the issue organized by liberal members largely focused on how to reduce enforcement and detention. Democratic leaders have made tentative plans for a House vote in the coming months on a bill to grant protections to the young undocumented immigrants known as “dreamers,” as well as those residing in the U.S. under temporary refuge programs — both groups who have seen their status cast into doubt by Trump policies. But that legislation does not address the border crisis, either by providing more administrative resources, reversing Trump administration policy changes or updating an asylum system that Trump has publicly criticized for much of his presidency. Between October and February, U.S. Customs and Border Protection apprehended 268,044 migrants — the fastest pace recorded by the agency since 2008 and more than double the rate seen two years ago. Compounding the surge, the Trump administration has tightened policies around asylum claims — including greatly reducing the number of migrants who are being admitted to the U.S. while their claims are adjudicated. Senate Majority Leader Mitch McConnell (R-Ky.) told reporters Thursday that “there are some changes in the law that we need to make” to address the border crisis, referring to asylum procedures. “It’s way past time to have a serious discussion about how to solve a multitude of these problems, all of which cannot be solved by a change in personnel,” he said. But the kinds of changes Trump is seeking — which are meant to make it easier to quickly evaluate claims and return migrants to their home countries if they are denied entry — are a nonstarter for most Democrats. As various lawmakers paraded through the nearby media gallery, the divisions in how — or whether — to address the border were on display. While Congressional Progressive Caucus leaders called the border situation a “manufactured crisis,” placing blame on Trump’s anti-immigration crackdown, leaders of the centrist New Democrat Coalition told reporters they would support more funding for migrant detentions or new immigration judges who could reduce backlogs on asylum claims. The internal dispute could play out in the coming 2020 appropriations process: Progressive Caucus leaders are preparing to take a hard line on immigration funding, the group’s co-chairs said Thursday. Reps. Pramila Jayapal (D-Wash.) and Mark Pocan (D-Wis.) said they would both seek to limit funding for enforcement agencies and also curb the ability of executive branch officials to transfer funds that could be used, for example, to buy more detention beds. Both lawmakers said the surge in apprehensions was of Trump’s own making, citing slowed asylum processing at official ports of entry. Immigrants, she said, are instead seeking to cross the border illegally to be apprehended and immediately claim asylum. Rep. Veronica Escobar (D-Tex. ), whose district includes part of the U.S.-Mexico border, said she, too, would be open to cutting enforcement funding. She voted against the February spending deal in part because it included a financial boost for immigration agencies, she said, and since then has sought an audit of Department of Homeland Security spending habits. Other Democrats said the party’s response to the border, barring an unlikely deal with Trump and Republicans, would have to be more about oversight and less about legislation. Assistant Speaker Ben Ray Luján (D-N.M.), the highest-ranking Latino in Congress, said Democrats would continue visiting the border to highlight the issues there and continue asking questions of administration officials — especially in light of the departure this week of Homeland Security Secretary Kirstjen Nielsen and other top department officials. “What are they doing and what aren’t they doing? There are a lot of questions that the American people have and that Congress has,” Luján said. “If we can give people confidence, end some of their insecurities about their own economic situation, I think there will be a better atmosphere among some who are opposed to immigration in the country,” she said.